Karen Ibasco, 26, bested 39 other aspirants in ceremonies at Mall of Asia Arena in Pasay City on Saturday night for the right to represent the Philippines in the global Miss Earth pageant, and to serve as an ambassador for environmental protection. “Joining Miss Philippines-Earth is representing the scientific community and making the people understand the science behind climate change,” Ibasco told the Inquirer after her coronation. “I really want to share a message, to tell the people what they can do to save the Earth,” she added. The Miss Philippines-Earth pageant runs on the platform of environmental protection and its winners, since its inception in 2001, have launched projects that help save the planet. “I will use my title to continue my advocacy, use it as my platform to reach out to a wider range of audience, different people, as I continue to share my voice when it comes to conservation of energy and embracing renewable energy,” Ibasco said. During the final round of questions, the five finalists were asked what environmental policies they wanted to change. Also proclaimed winners were Miss Philippines-Air Kim de Guzman from Olongapo City, Miss Philippines-Water Jessica Marasigan from Caloocan, Miss Philippines-Fire Nellza Bautista from Villanueva, Misamis Oriental, and Miss Philippines-Ecotourism Vanessa Mae Castillo from Lobo, Batangas. Miss Philippines Earth 2017 is supported by partners: SM Markets, Diamond Hotel (the Official Residence) and Miss Earth Foundation. Watch the full show by clicking here. Miss Philippines Earth Goes Transparent! You can now get a chance to witness the Miss Philippines Earth delagates during the prejudging competitions live on Facebook. The predjuging shall be held on three separate occasions; figure & form, beauty of face & poise and intelligence category where the top 12 finalist will be choosen and announce at the finals on July 15 at the Mall of Asia Arena, with live stream by rappler.com and telecast on ABS-CBN on July 16 at 10 am and on The Filipino Channel (TFC). Judges of each category shall be personalities from related fields of expertise. Visit our facebook page @missphilearth for the dates, time and venue. Miss Philippines Earth 2017 is supported by partners: SM Markets, Diamond Hotel (the Official Residence), Brigada FM 104.7 and Miss Earth Foundation. After a victorious back-to-back win for the Philippines by Miss Earth 2014, Jamie Herrell and Miss Earth 2015, Angelia Gabrena Ong in the Miss Earth pageant held in Vienna, Austria, Angelia has also successfully completed the CLIMATE REALITY LEADERSHIP CORPS training under Mr. Al Gore, founder and chairman of the Climate Reality Project and former Vice President of the United States. “Miss Earth’s presence in the Climate Reality Leadership Corps training signifies more than ever that Miss Earth is an effective platform to create environmental awareness especially on climate change. We also make sure our delegates are briefed on the significance of the COP Paris Agreement to be abreast with environmental issues.” explained Mr. Ramon Monzon, Chairman and President of Carousel Productions Inc. This year, the much awaited environmental event known as Miss Philippines-Earth shall be presenting 48 beautiful and inspiring environmental ambassadors from different municipalities and cities in and outside the country . As part of their advocacy to fight climate change through the 5R’s; Re-think, Reduce, Re-use, Recycle and Respect; the delegates had started their community eco activities since March. “The delegate with the most outstanding eco campaign will receive the special “Earth Warrior” award. Another award shall also be given to the delegate’s municipality or city which has the most outstanding environmental project. This is one way of giving significance to the communities who exert effort in combating climate change.” explained Lorraine E. Schuck, EVP of Carousel Productions Inc. The Miss Philippines Earth realizes it’s advocacy by educating the youth thru Miss Earth Foundations’s “I Love My Planet Earth” school tours with pro-environment partner HANA Shampoo in environmental campaigns. To deepen the relevance of Miss Philippines Earth this year, the coronation night will be on June 11, 2016 6 PM at the U.P. Theater with live streaming by Rappler. Telecast on ABS-CBN June 12, 2016 10:30 AM (before ASAP) and on The Filipino Channel (TFC). 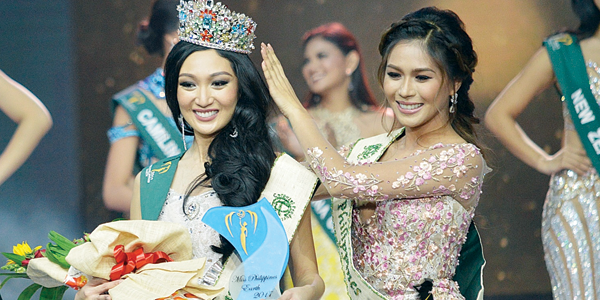 Cebu City Wins Second Miss Philippines Earth Crown! Miss Philippines Earth 2014 Candidates discussed about their Ecotourism spots, in their respective regions. Tackled about their potential sites, environmental threats and their own conclusions. The gorgeous beauties of Miss Philippines-Earth 2014 showcased their most ingeniously creative and stunning creations on the catwalk of Patio Victoria, Intramuros, on the evening of April 9, 2014. Materials of their dresses were composed of ordinary everyday objects, reusable or even useless items, which were transformed into fashionable works of art by their own sponsored designers. All candidates had their moment to strut in their best form in front of the judges. They all received praises and at times, intriguing critique, from renowned celebrity personalities such as Eric Pineda and Joyce Ann Burton, who were amazed at how such ‘trash’ had been entirely transformed to class! Winners of the night were Miss Cebu City for the Bronze medal, Miss Gapan for Silver and Miss Tanauan for the Gold! A successful competition with much thanks to HANA Shampoo, our presenter and also to PATIO VICTORIA, Intramuros our venue partner. Click here for more photos of the event. Miss Philippines Earth 2014 joins the Earth Hour event at SM Mall of Asia, SM Aura Premier, SM North Edsa and SM Megamall. Tears of joy flowed down the cheeks of Olongapo City's Angelee Delos Reyes as she was crowned Miss Philippines Earth 2013 at the coronation night held at the SM Mall of Asia Arena on May 19, 2013. The top three candidates with the highest accummulated facebook "likes" and website votes were awarded as the Most Photogenic at Seventh High. Miss San Pablo City with 13,834 votes won the gold medal, the silver medal went to Miss Zamboanga City with 8,935 votes and Miss San Pascual with 8,749 votes bagged for the bronze medal. Chosen as the Best in Evening Gown for Miss Philippines-Earth 2013 and awarded with the gold medal for the said category was Miss Mabalacat City. Misses Cabugao, Ilocos Sur and Taguig City received silver and bronze medals, respectively. The GREEN Initiative aims to eliminate poverty, protect our natural resources and promote the beauty of the Philippines. Miss Earth Foundation and Miss Philippines Earth are proud to partner with ABS CBN Foundation, Bantay Kalikasan, DENR, DOE, DOT, Ateneo de Manila University in this worth while project. Yes to AGRICULTURE and ECO-TOURISM! President of Carousel Productions, Inc. Mr. Ramon Monzon with Secretaries Ramon Jimenez and Ramon Paje and CPI Executive Vice-President Ms. Lorraine Schuck. “It is project such as this that makes us feel that the Philippines is definitely going somewhere within the next few years, “ says Dr. Evangeline Bautista, ADMU’s Dean of School of Science and Engineering and Acting Vice-President of Loyola schools. 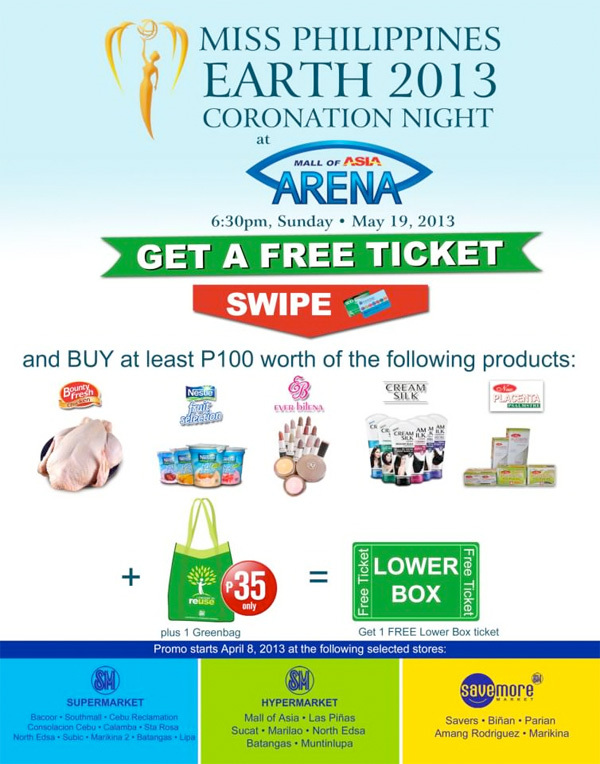 Buy these products from select SM Food Group stores to get great lower box seats to the Miss Philippines Earth 2013 Grand Coronation Night at the Mall of Asia Rena on May 19! See photo below for more details. Our most knowledgable ladies from last night's event! Congratulations to our Trivia Challenge winners - Bronze: Miss R.T. Lim, Silver - Miss Muntinlupa City, Gold: Miss Mabalacat City. What could be a most fitting way to celebrate EARTH DAY than presenting 48 young beauty queen aspirants from all over the nation who are set to further the noble environmental cause in the country’s most relevant beauty search. Miss Philippines-Earth 2013 continues the legacy of beauty and responsibility by gathering the lovely gems from Luzon, Visayas and Mindanao. Charming and captivating in their own ways, these ladies are just as eager to win the coveted crown and do their share in heeding the call of Mother Earth. Under the stewardship of the Miss Earth Foundation, this year’s delegates embark on several activities that promote the global movement to protect and conserve water resources. Taking cue from UN’s declaration of 2013 as the International Year of Water Cooperation, the 13th edition of the pageant will see the candidates campaigning for proper water distribution and management. The movement was taken globally by Miss Earth Foundation Executive Director, Cathy Untalan together with MISS EARTH 2012, Tereza Fajksova in collaboration with MISS EARTH organizers of different countries which included Indonesia, Finland, Reunion Island and Mauritius. For EARTH DAY, the candidates involved themselves in several environmental undertakings such as “Tigil Buga” along Ayala Avenue, Makati City; Coastal Cleanup at Freedom Island, Paranaque City; Critical Mass Ride along Quezon City; Urban Gardening and Composting seminar in Makati; and Walk with M.E. at the SM Mall of Asia in partnership with the SM Food Group, DENR Firefly Brigade and Heirs of the World. The country’s eco beauties also encouraged the members of the press to share their advocacy for a cleaner and sustainable Earth in their media endeavors. Miss Philippines-Earth is definitely one enriching experience. More than just crowning beauty queens, the pageant also gives a once-in-a-lifetime opportunity for the candidates and eventual winners to be involved in a noteworthy cause. For the past 12 years, Miss Philippines-Earth has championed the promotion of a better and cleaner environment, something that no other beauty pageants in the country have accomplished. With the 13th queen waiting to be crowned in just a few weeks, the pageant’s mission is sure to soar to greater heights and touch the lives of Filipinos in more ways than one. The much-awaited grand coronation night will take place on May 19, Sunday, at the SM Mall of Asia Arena and will be telecast live on ABS-CBN at 10:30 PM. A spectacular visual treat that has never been done before in beauty pageant staging awaits the Miss Philippines-Earth’s avid followers. The newest batch of Eco-Beauties competing in this year’s MISS PHILIPPINES-EARTH officially introduced themselves at the press conference held at F1 HOTEL MANILA, the official residence of MPE 2013. These “Beauties for a Cause” proudly presented the media their advocacies for cleaner environment and wise voting at the elections. Apart from the exciting new challenges which the candidates will engage in, the pageant will be staging an original, revolutionary experience in pageant history which will be the most awaited highlight of the coronation night happening on May 19 at the MOA Arena, telecast on ABS CBN’s Sunday’s Best. 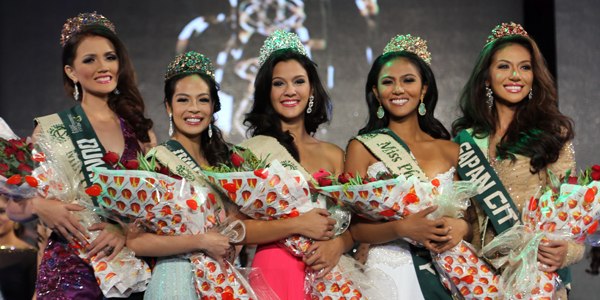 The three Miss Philippines-Earth 2013 favorites were voted by the media as their "Darling of the Press" awarding Miss Nagcarlan the Bronze, Miss Muntinlupa with Silver and Miss Olangapo with the Gold medal. More photos here. It was a night of competitive glamour and originality at the cultural evening of cocktails at the SMDC showroom where the Miss Philippines-Earth 2013 beauties displayed their most artistic and flattering national attires tailored by some of the countries fashion designers. A distinguished panel of judges awarded the Bronze medal Miss Cebu City, Silver to Miss Zamboanga and Gold went to the evening's charmer, Miss Misamis Occidental. More photos here. The girls showed how a children's party can be tastier with Bounty Fresh Chicken and Chicken Hotdogs and of course, their culinary prowess! Congrats to our winners - Bronze: Marilao, San Marcelino, Calapan, Boljoon, Makati, Mabalacat, Zamboanga, Cebu City. Silver: Ipil, Bacolod City, Sogod, Tanza, Cabanatuan, Tanauan, Talisay. Gold: San Pedro, Quezon City, Caloocan, Rodriguez, Lipa, Olongapo, Paranaque. More photos here. The Miss Philippines-Earth 2013 candidates became "Big Sisters for a Day" for the Gawad Kalinga Kids at Storyland and at The Croods. The "Big Sister" winners voted by kids were Miss Caloocan City (Gold), Sogod,Cebu (Silver) and Dipolog City (Bronze). More photos here. The Dance Competition was held at the Enchanted Kingdom last April 14. The winners were Miss San Marcelino, Zambales (Gold), Miss Muntinlupa City (Silver) and Miss Mabalacat City (Bronze). The Dance Competition is the first leg of the Talent Competition. Medal points will be added to the other talent events. The Miss Philippines-Earth 2013 candidates competed for the Best in Swimsuit award at Golden Sunset Resort in Calatagan, Batangas on April 13. The winners were: Miss Olongapo City (Gold), Miss Taguig City (Silver) and Miss Sogod, Cebu (Bronze). More photos here. 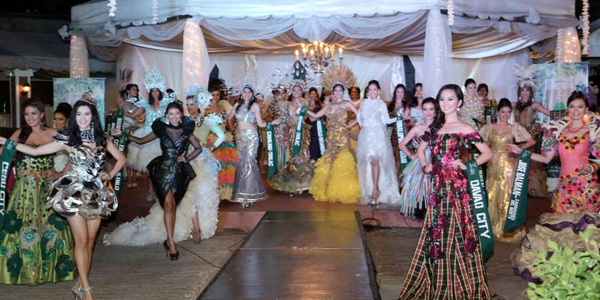 The Miss Philippines-Earth 2013 candidates competed for the Resorts Wear category at Pontefino Hotel and Residences in Batangas on April 12. The winners were: Bronze- Miss Taguig City, Silver- Miss Misamis Occidental and Gold- Miss Cabugao, Ilocos Sur. More photos here. Make up Challenge with Ever Bilena Cosmetics. The winners are: Bronze: Candon City, Silver: Marikina City, Gold: Mun. of Sogod, Cebu. After the personality development and catwalk trainings, the Most Enthusiastic Learners were awarded: Bronze: Cebu City, Silver: Zamboanga City, Gold: Mun. of Santa Maria, Bulacan. Once again, the candidates of Miss Philippines-Earth 2013 will have a Resorts Wear Competition at Pontefino Hotel and Residences in Batangas City on April 12, 2013 and a Swimsuit Competition at Golden Sunset Resort in Calatagan, Batangas on April 13. Catch these gorgeous beauties as they flaunt their lovely forms in their most fashionable resort wear and swimsuit. A very special thanks to Pontefino Hotel and Residences and Golden Sunset Resort for supporting Miss Philippines-Earth 2013! Stephany, Miss Philippines Earth and Miss Earth Air 2012 hosted the signing of the Memorandum on the Conservation and Management of Dugongs (Dugong dugon) and their Habitats throughout their Range this morning in Taguig. This event was put together by the Protected Areas and Wildlife Bureau headed by Director Mundita Lim and DENR-PAWB Coastal and Marine Management Office Director Jacob Meimban Jr.
2013 is the International Year of Water Cooperation. Let's also preserve and protect our marine species. 4. Wait for our acknowledgement email. If you do not receive a response in 24 hours, please call the office. 5. Prepare all documentary requirements to complete your application. 6. For further queries, please contact Carousel Productions, Inc at 7241810 from 10:00 - 7:00 PM and look for Chris. Copyright 2016. MISS PHILIPPINES-EARTH | CAROUSEL PRODUCTIONS, INC. All Rights Reserved.